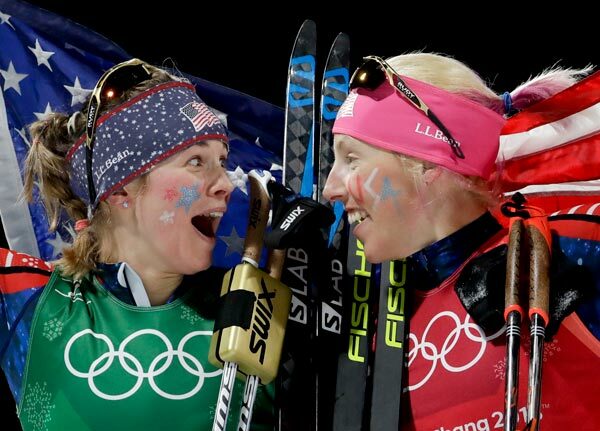 PYEONGCHANG, South Korea -- Marit Bjoergen made Olympic history and the United States women's cross-country team won its first medal ever - and it was gold. 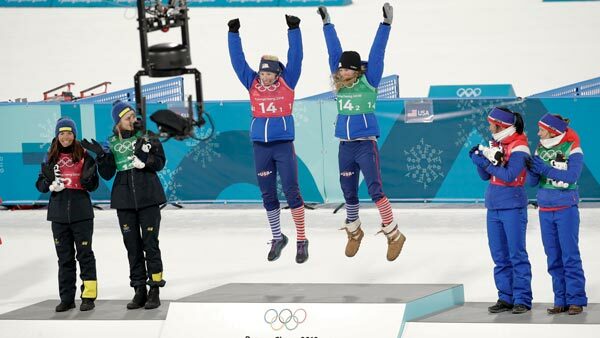 United States' Jessica Diggins, left, and Kikkan Randall celebrate after winning the gold medal in the women's team sprint freestyle cross-country skiing final. The Americans posted the fastest time in the semifinals and started on the front row in the final. Diggins passed the Swedes and the Norwegians on the final lap to win the first Olympic gold medal for the United States in the sport. Sweden took silver. The 37-year-old Bjoergen has won four medals at the Pyeongchang Games. She took gold in the women's 4x5-kilometer relay, silver in the 15-kilometer skiathlon and bronze in the 10-kilometer freestyle. She still has one event remaining - the 30-kilometer mass start on Sunday - if she chooses to participate.